Franken, who is now the junior Democratic senator from Minnesota, was headlining the event. Tweeden was emceeing. Tweeden said Thursday that she knew ahead of time that Franken had written a skit where his character tries to kiss her. "On the day of the show Franken and I were alone backstage going over our lines one last time," Tweeden wrote in a post for 790 KABC, the radio station she works for in Los Angeles. "He said to me, 'We need to rehearse the kiss.' I laughed and ignored him. Then he said it again. I said something like, 'Relax Al, this isn't SNL... we don't need to rehearse the kiss.' He continued to insist, and I was beginning to get uncomfortable." She did end up performing the skit as written, she continued, turning her head away while on stage so Franken couldn't kiss her. When she was on her way home to Los Angeles, she said, she fell asleep on the plane. 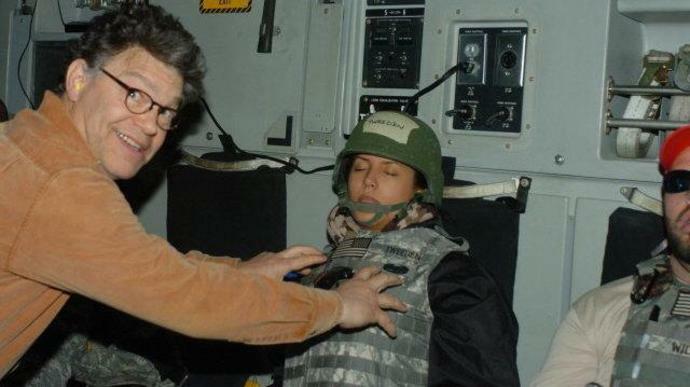 While she slept, Franken grabbed her breasts and had a photo taken. "I couldn't believe it. He groped me, without my consent, while I was asleep," she wrote. "I felt violated all over again. Embarrassed. Belittled. Humiliated. How dare anyone grab my breasts like this and think it's funny?" Franken responded in a press statement Thursday. "I certainly don't remember the rehearsal for the skit in the same way, but I send my sincerest apologies to Leeann," he said. "As to the photo, it was clearly intended to be funny but wasn't. I shouldn't have done it." USO did not immediately respond to a request for comment. Senate Majority Leader Mitch McConnell (R-Ky.) on Thursday called for an Ethics Committee review of the allegation. "Regardless of party, harassment and assault are completely unacceptable ― in the workplace or anywhere else," McConnell said. Last month, following a whirlwind of accusations against Hollywood producer Harvey Weinstein, Franken wrote in a Facebook post about the "disappointing responses" women often receive after sharing their stories. He also said he was working to pass the Arbitration Fairness Act, which would allow people who have faced workplace harassment to go to court. Mike Sacks, a political correspondent for Scripps and former producer for HuffPost, noted on Twitter that in Franken's book Giant of the Senate, he says he decided to run for public office after the 2006 USO tour. Franken was elected to the Senate in 2008. CORRECTION: Due to an editing error, a previous version of this story misstated Sacks' professional affiliation. He works for Scripps, not Esquire.